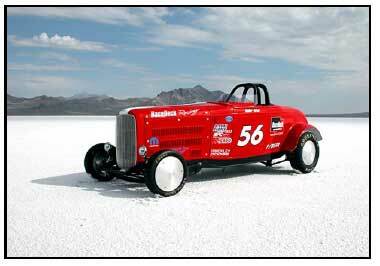 Jorgen Moller, Owner of flooring maker RaceDeck®, was proud to announce that their RaceDeck Salt Rod project recently set records at the Bonneville Salt Flats, earning the title of "Worlds Fastest Four-Cylinder Street Roadster". With a 700-horsepower turbocharged Dodge SRT-4 engine nestled within the car’s distinctive red-and black painted body ( and driving the rear wheels), the car broke two record’s at last summer’s Speed Week and followed that up with even faster runs at the World of Speed event. At the World Finals in October, the Salt Rod set its current 197,4 mph record, and in doing so clocked its fasted speed at 200.555 mph in the first pass. Crewing for the car were Dave Harris and Phil Hurst, both drafted for the project by their boss Jim Hinckley of Hinckley Dodge. Other crucial sponsors included Darrell Cox Racing, Precision Turbo, TurboTune, HPC, Royal Purple, Lochhart Enterprises, and Deist Safety.